My husband’s uncle turned 70 on Friday, and we weren’t able to fly out for his big party, so I wanted to make him something. 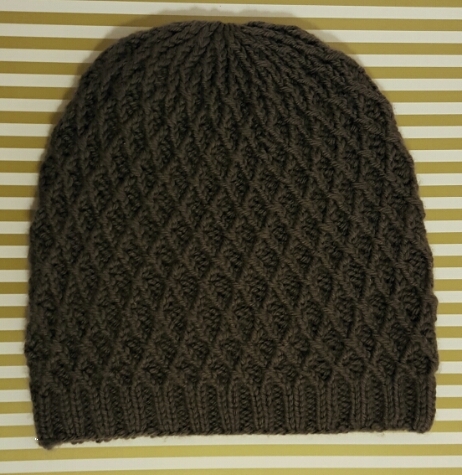 My other crafting love is knitting, so I made him a hat. This is the Koolhaas hat from Brooklyn Tweed, knit in Knit Picks Capra (Caviar colorway); our uncle lives in SLC, so I wanted to make sure it was warm. Plus cashmere = yummy. The pattern is a fun knit, never boring, but this is definitely not a weekend project. Lots of cables. What I’m saying is knit it for an uncle or a dear friend, not a friend of a friend’s third cousin. Hashtag labor of love. Of course, I made a card to go with the hat. And I wanted it to be fancy, so the first thing I reached for was the Winter Wonderland Specialty paper from the holiday catalog. A few of the papers in the pack are overtly holiday-themed, but many aren’t, so this paper is great for holidays, party invitations, fancy birthdays… I used four papers from the pack on my card. For the confetti, I used both my Fringe Scissors (cutting strips of Basic Black and Gold Foil paper, then cross-cutting the strips to make tiny squares) and the Confetti Stars Border Punch. I punched both Gold Foil and Black Glimmer paper with the Stars punch, but I can’t recommend cutting the Glimmer paper with it. I wasn’t sure my punch was going to open back up and was worried I had broken it — when that happens, it usually means I was trying to punch something I shouldn’t have. I glued the confetti on using the Fine Tip Glue Pen. 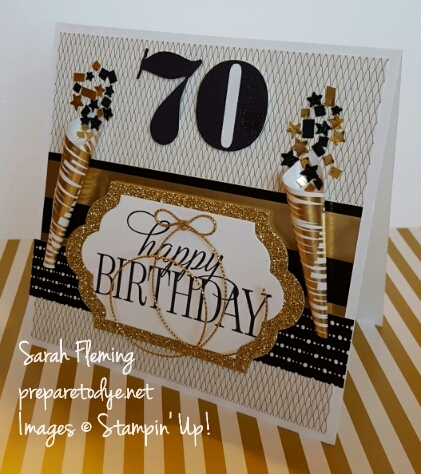 The “70” is from the Larger Than Life Alphabet & Numbers stamp set. “Happy Birthday” is from the host set Happy Birthday Everyone. I wanted to include a tag with the hat that included fiber content and washing instructions, so I punched out a tag with the Note Tag punch, used a hole framelit from Chalk Talk to make the hole, wrote the information on one side of the tag and stamped the other side , then tied the tag around the hat with the same Gold Cording Trim that I used on the card. I heard that our uncle loved both the hat and the card. 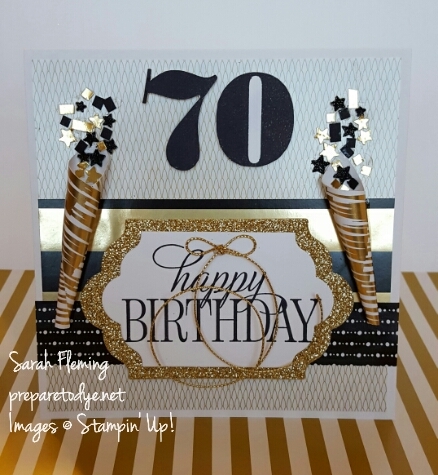 :) The supplies I used to make the card are below, and the images link directly to my online Stampin’ Up! store. I have a ton of cards to show you, so check back soon.